Whether you are a small business owner hoping to get your business online and take it to the next level, or you are interested in building a loyal following for your blog or your mature website, you are going to need a newsletter manager to help you manage your lists easier. Online marketers have used list mangers for a long time to expand their business and make more money with less effort. 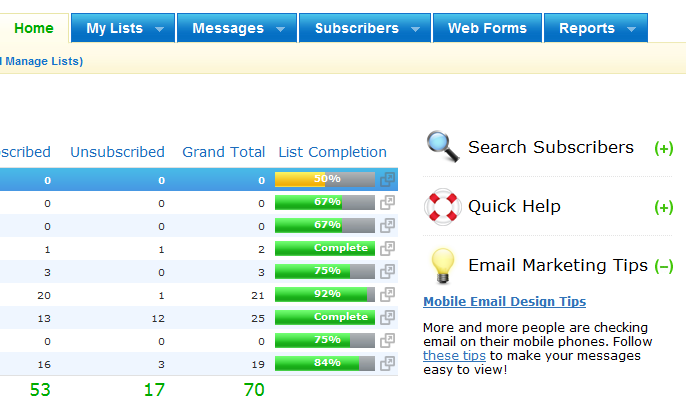 These services not only make it easy for your visitors to subscribe and unsubscribe from your lists. They also help you stay compliant and reduce your liabilities as well. As a business owner, you want to make sure you pick the right outsourcing partner to manage your e-mail lists. That means you want to choose a service that doesn’t life difficult with its interface and provides you with appropriate support. Of course, you can always manage your newsletter yourself if you have the resources. But problems will arise from time to time, so you want to be ready for it. Aweber: we may be a bit biased here, but Aweber has been a service that we have been using for years, and it continues to be a great partner for our business. The interface is very easy to get used to and the service gives us a lot of control over our forms and how we manage our lists. Managing subscribers couldn’t be easier. Besides, the service is very affordable too. If you are going to have a lot of lists, you are going to enjoy working with Aweber. You don’t have to be a genius to realize that the future belongs to greener technologies. Many companies have already started adopted eco-friendly standards to help save the environment and save the consumers money in the process as well. Many consumers have taken things in their own hands by going solar or setting up their own windmills. There is no better time to be an ecopreneur. But you don’t have to own a shop or have a physical product to make it in this industry. Thanks to the power of the Internet, you can continue being an inetpreneur and make money in the green field as well. Blogging: green blogging is one of those careers that can be rewarding and fun at the same time. As long as you can provide unique value, there is no reason you shouldn’t go for it. Portal: a green portal similar to what WebMD has done can be extremely useful for folks who are interested in going green soon. Vlogging: creating a web show about green products and technologies can also make you a bit of money and help you expand your business. If you love video, don’t ignore this. Guides: showing people how to go green and save money in the process can earn you money online as well. Many have successfully sold their green DIY guides and you can too. But make sure you provide real value. Tips: creating a tips website or newsletter can also help you make money on the side (whether it’s advertising or your website). Affiliate Marketing: you can always promote affiliate products and make money online without any risk at all. Book: if you are an expert in this field, you can always try to write a book about it. You can use Lulu, Amazon Kindle platform, and other third party services to get the job done. Marketing: helping green startups bring their products to the market is another way to get involved in the green tech industry. Membership sites: you can offer people a chance to join your membership site in return for your coverage of cutting edge green technologies and world class practices. Social Media: creating a social media using Ning or other services out there is a good start. You can also invest in your own custom-designed social network or forum to help your users get the most out of your community. There you have it. There are plenty of ways to make money in this field as long as you offer some unique value to your prospects. Green is the future of business, so why not be a part of it. Your take: what type of green business you are interested about starting?